Rivers attract people, for both aesthetic values and the recreational opportunities that exist. To make the recreation accessible, there is a whole complement of facilities needed next to the river, including trails, parking lots, restrooms, information signs, boat ramps, ADA compliant access to the river, as well as safe access to the river’s edge for all ages. Through careful design the near river environment will allow a first time visitor to navigate as intuitively as possible, and major hazards will be hard to get to. Thank you for telling us about your day! If you were fishing or watching for wildlife, what did you see? 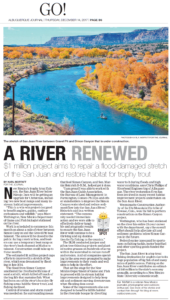 Riverbend Engineering has been working with the New Mexico Department of Game & Fish on its river restoration efforts as outlined in the Management plan for the San Juan River published in September of 2005. This reach of Quality Trout Waters is below Navajo Dam on the San Juan River in northern New Mexico east of Aztec & Bloomfield, NM. 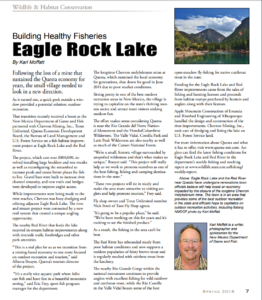 Projects include the Braids, Munoz Flats, Hammond Tract, Simon Canyon, and the Rainbow Lodge Boat Ramp. … about Simon Canyon & Rainbow Lodge. … a summary of projects to date. … about Phase III – below Cottonwood Campground. … about Phase II – below Simon Canyon. 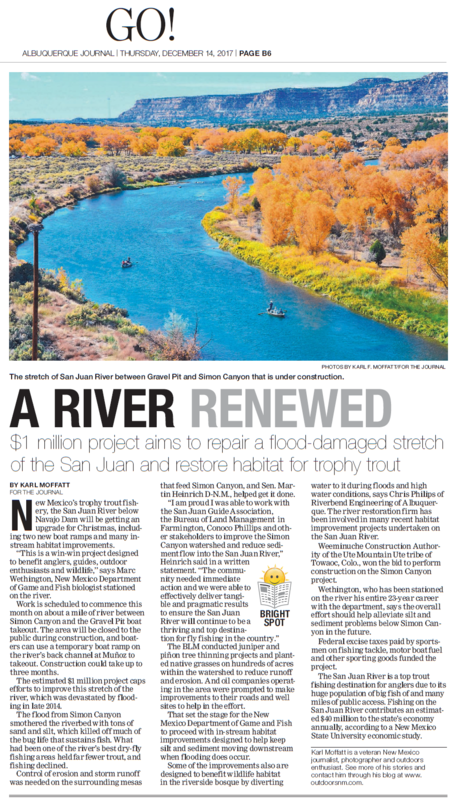 The San Juan River Improvement project included master planning, design, and construction oversight. Improvements included five whitewater waves (with fish passage), two boat ramps, three irrigation diversions, many in-stream fish habitat structures, rehabilitation of two fishing ponds, pedestrian trail extension and connections to public restrooms and parking. The scope of work also includes floodplain analysis of several river sections in preparation for FEMA revisions, design and installation of a shallow groundwater pumping system for irrigation supply, many public meetings and Town Council presentations, grant writing and grant application presentations, and other related consulting. “A wonderful transformation has occurred in downtown Pagosa Springs over the last couple of weeks, and it’s time to officially thank the various talented individuals and generous citizens who made our new river improvement project such an apparent success. Through the efforts of these folks a new whitewater feature, as yet unnamed, has been created, and fish habitat and fisherman’s access have been enhanced. This project of San Juan County, NM stabilized the banks and improved ripariain habitat at the Lions Park in Kirtland, NM. There were also recreation site improvements including a boat ramp. The Town of Red River, NM has a long history of enjoying the river as it runs right through town. The Town identified 3 Phases of restoration work and has since completed 2/3 of the stretch. Phase 1, “Young’s Ranch Reach” runs through the east edge of town and was a priority due to heavy damage from flooding in the spring of 2005, which resulted in considerable bank erosion and soil loss. Sediment from the flooding also caused impacts to downstream water quality. Several homes had become threatened by stream bank erosion, and public utilities had been damaged by the flood. In 2006, the Town completed its first river restoration project on the east end of town. A combination of bank stabilization treatments, riparian transplants, and in-stream aquatic habitat structures were installed to repair the existing flood damage, mitigate against future flood damage and water quality impacts, and improve the natural habitat within the project area. Phase 2, “Red River Westside Fishing Park”, runs through the west edge of Town and was completed on a very fast time-line. Approval of the funding was officially announced on January 10, 2014, and construction was completed before the end of April, allowing time for stocking and plentiful fishing for the Memorial Day holiday. Historic mining, land use and removal of streamside vegetation had degraded this reach of the Red River to the point where it would hold very few fish. The river was wide and shallow, with very little fish habitat. Improvements to the river have included the installation of various rock structures for fish habitat, excavation of some deeper pools in the river, rock reinforcement of some stream banks to reduce erosion, and planting a mix of native willow and shrub species, and cottonwood trees. These plantings will increase shade, reduce erosion of the river’s banks, and attract birds. The New Mexico Department of Game and Fish stocks this reach of the river several times each year. Phase 3, “Town Reach Restoration Project” runs through the middle of downtown Red River and is funded by the State of New Mexico Environment Department’s River Stewardship Program Grant. This project was completed in October of 2016. Riverbend prepared a Feasibility Analysis Report for Low Head Dam Modifications to the Animas Pump Station Diversion on the Animas River at Penny Lane Dam in August of 2013. This low head dam was constructed in 1984 to allow for diversion of water from the Animas River for the public water supply of the City of Farmington. Water taken out of the river is pumped up to Lake Farmington, a raw water storage facility located on a hilltop to the north. Since its construction the dam and diversion facilities had met the project goals for water diversion, but had created the un-intended consequence of preventing fish passage and the un-desirable effect of dangerous hydraulic conditions for boats to float through (resulting in two deaths, in 2005 and 2011). Riverbend conducted a feasibility study which included design alternatives to improve fish passage conditions, and to improve boater safety conditions, as well as building a whitewater wave feature at this location. 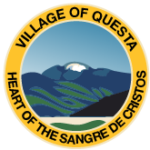 Final design and environmental documentation were completed in 2015, and construction took place October 2016 – January 2017. Now on the Animas River fish can travel up and downstream, and the new waves provide two options (two degrees of difficulty) for fun and safe boating from the way from Colorado/ New Mexico state line all the way to Kirtland.